Official U.S. Navy photo of the future USS Shenandoah (ZR-1). 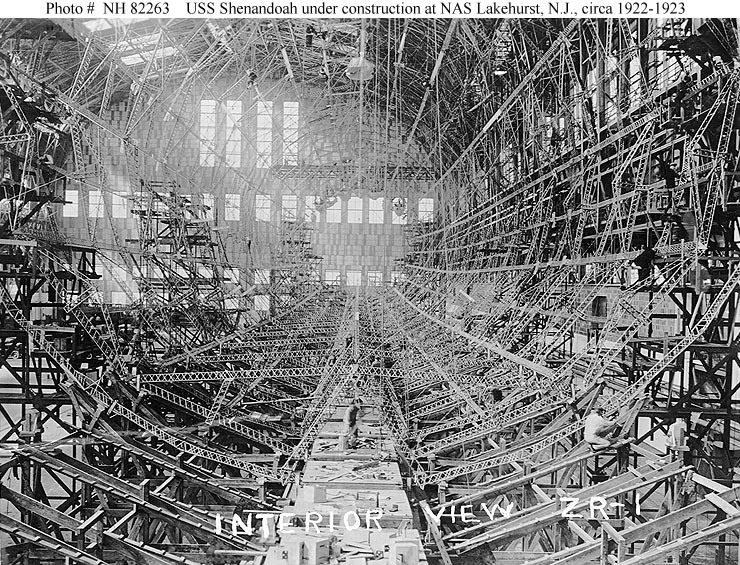 Lee Corbin comments: "[I believe this photo was] taken at the Naval Aircraft Factory in Philadelphia where the Shenandoah's structure was fabricated prior to shipment to Lakehurst for assembly." Library of Congress photo, call number: LC-B2- 5968-8, record URL: http://www.loc.gov/pictures/item/ggb2006011146/. Bain Collection. 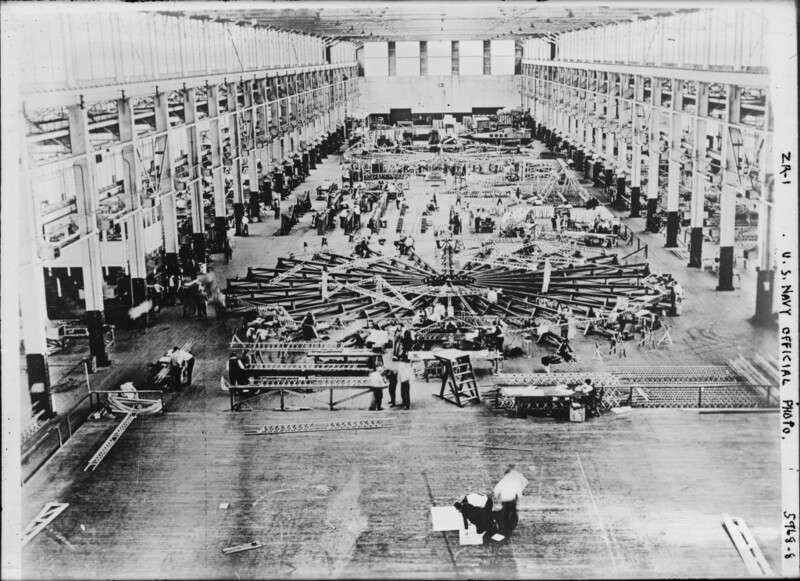 View of the interior of the future USS Shenandoah (ZR-1), while she was under construction inside the airship hangar at Naval Air Station Lakehurst, New Jersey, in 1922–1923. 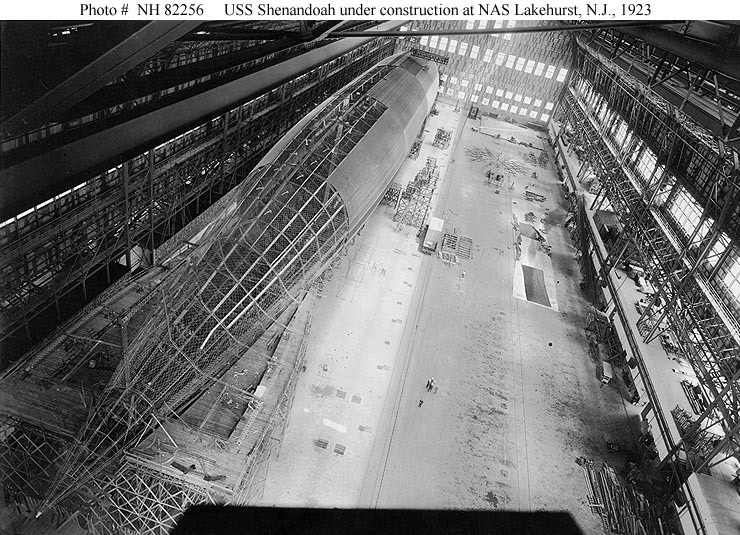 View looks aft along Shenandoah's keel, showing her midships frames in place. Those at her bow and stern have not yet been erected, but supports for some of the missing frames are visible in the foreground. Collection of Admiral Thomas C. Kinkaid, USN, 1973. U.S. Naval History & Heritage Command photograph (# NH 82263). 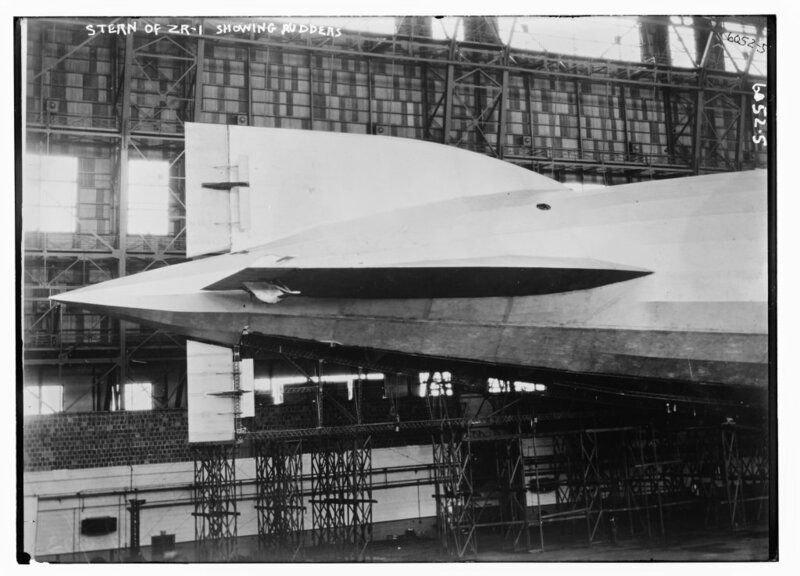 The future USS Shenandoah (ZR-1) under construction inside the airship hangar at Naval Air Station Lakehurst, New Jersey, 1923. Note platforms at left used for erecting her horizontal tail fins. U.S. Naval History & Heritage Command photograph (# NH 82256). 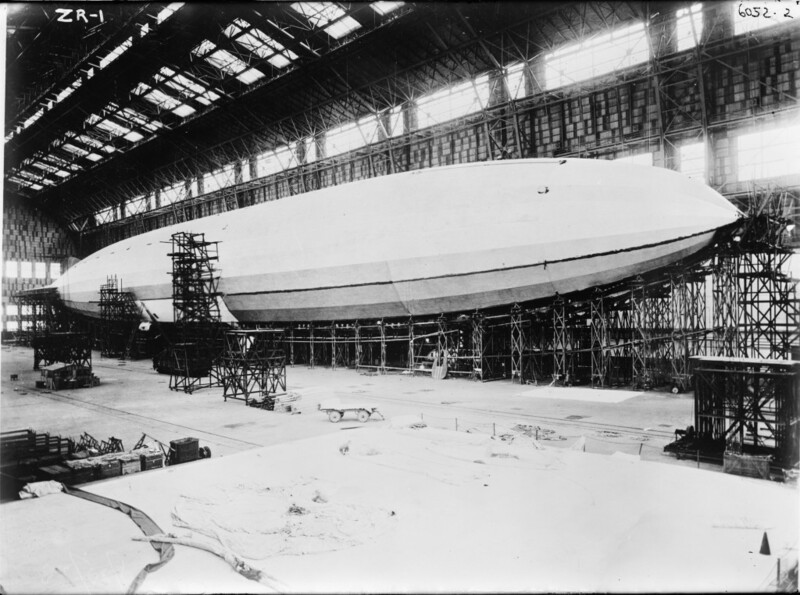 The future USS Shenandoah (ZR-1) under construction inside the airship hangar at Naval Air Station Lakehurst, New Jersey, 1923. This view was taken from the hangar floor, looking forward and to port from off Shenandoah's starboard quarter. Note the wooden scaffolding used to support her hull and to provide working platforms. U.S. Naval History & Heritage Command photograph (# NH 98224). 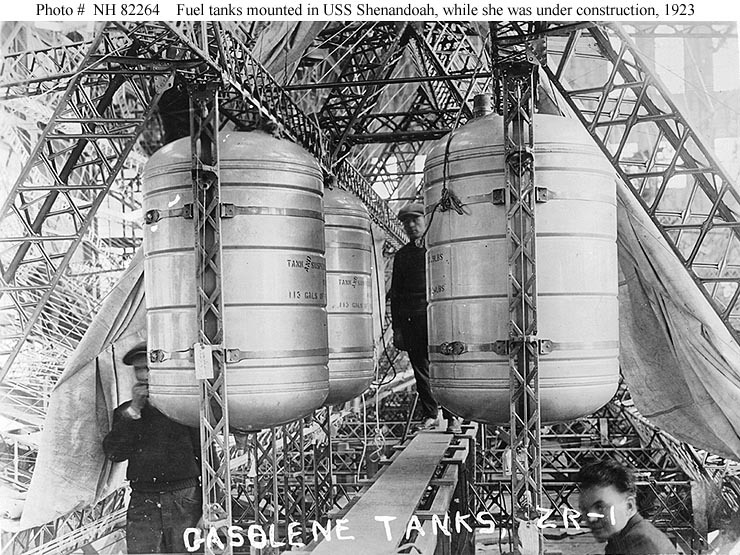 View of the interior of the future USS Shenandoah (ZR-1), showing tanks for her gasoline fuel. Taken while she was under construction inside the airship hangar at Naval Air Station Lakehurst, New Jersey, 1923. Note weight and capacity (113 gallons) markings on the fuel tanks, details of her aluminum structure, and the narrow (10" wide) catwalk used for crew movement inside the airship's hull. U.S. Naval History & Heritage Command photograph (# NH 82264). 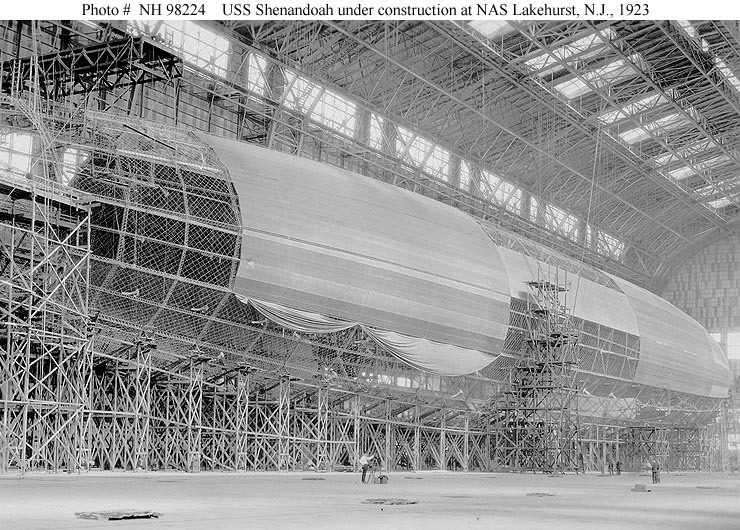 The future USS Shenandoah (ZR-1) undergoing work in Hangar One NAS Lakehurst, New Jersey. Handwritten comment on the bottom of the image reads "General View Showing Arrangement Of Gas Cells-Fuel And Framework". National Naval Aviation Museum (photo # 1999.060.073). 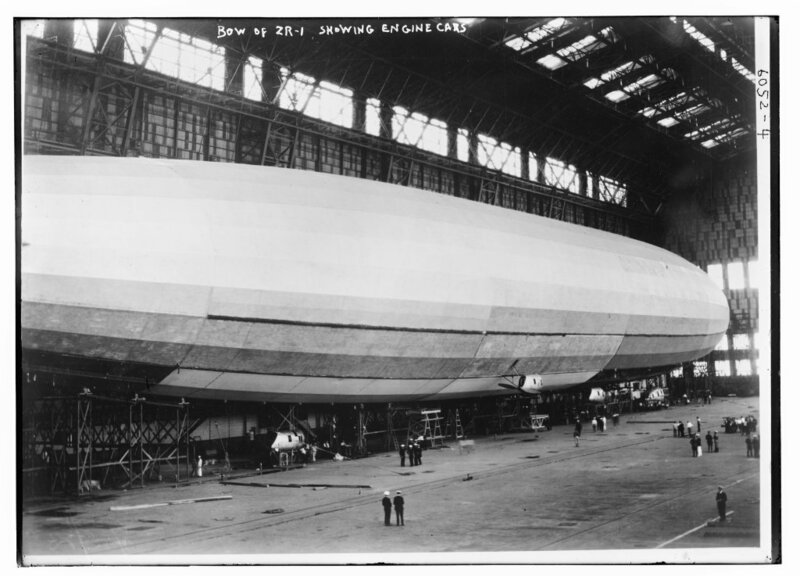 The future USS Shenandoah (ZR-1) newly completed, in a photo dated 25 August 1923. Library of Congress photo, call number: LC-B2- 6052-2. Bain Collection. Bow section of Shenandoah (ZR-1), showing engine cars. Library of Congress photo, call number: LC-B2- 6052-4. Bain Collection. 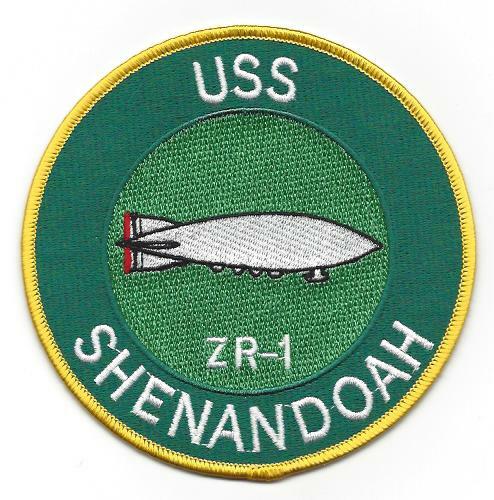 Stern of Shenandoah (ZR-1), showing rudders. Library of Congress photo, call number: LC-B2- 6052-5. Bain Collection. 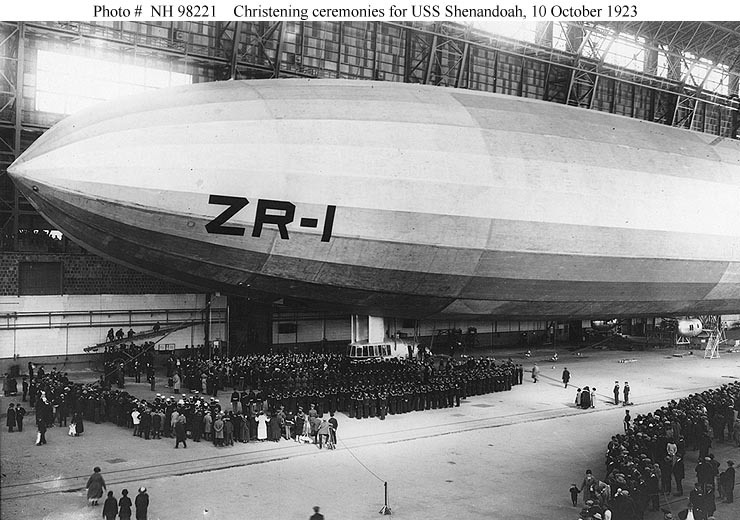 Christening ceremonies for USS Shenandoah (ZR-1), held inside the airship hangar at Naval Air Station Lakehurst, New Jersey, 10 October 1923. Collection of the Society of Sponsors of the United States Navy. U.S. Naval History & Heritage Command photograph (# NH 98221). 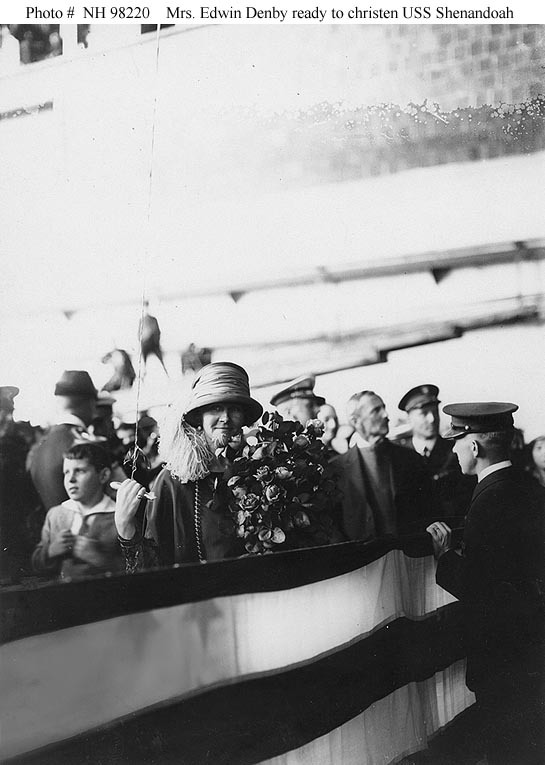 Mrs. Edwin Denby, wife of the Secretary of the Navy and Sponsor of USS Shenandoah (ZR-1) on the Sponsor's platform during the dirigible's christening ceremonies, held inside the airship hangar at Naval Air Station Lakehurst, New Jersey, on 10 October 1923. Mrs. Denby is ready to pull the cord that will break the christening bottle. U.S. Naval History & Heritage Command photograph (# NH 98220).